The Shadow will arrive in a unique profile as well as sleek exterior that would make it discreet when it comes to carrying your most valuable tech and electronic gear. Not only is it compact and lightweight, the Shadow’s interior will also be able to offer a spacious main compartment, a zippered pocket which can stash away smaller accessories as well as a padded laptop compartment that is more than adequate to keep a 15” MacBook or PC safe and sound. 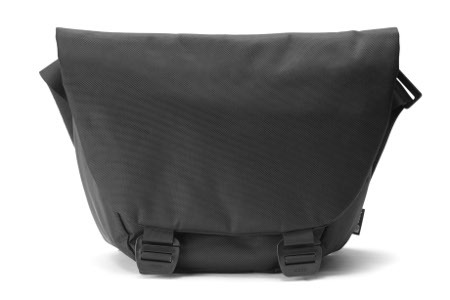 The Shadow messenger bag will arrive in black and gray shades, where it will retail for $130 and $160, respectively. Just in case you were wondering why is the gray colored Shadow more expensive, well, here is the very simple explanation. On the outside you will be able to find a water resistant jute, custom nylon seatbelt shoulder strap and a front flap which is secured with aluminium buckles. As for the black version, it will arrive with a water resistant 1680D ballistic nylon material, custom nylon seatbelt shoulder strap and a front flap that is also secured, albeit with plastic buckles that logically speaking, ain’t all that tough. Either way, both of them will come with a large back pocket for exterior storage.